Sattahip is one of interesting districts in Chonburi, where the location of this district is next to Banglamung District (Pattaya). 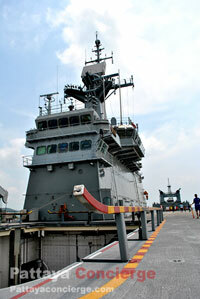 Because about half of the territory of Sattahip is touching the sea, there are naval bases situating along its coast. Those who have been in Sattahip would have already know this, because many attractions are under responsibility of Thai navy. However, the security from the navy would make a little annoying for visitors (you need to exchange your passport with a gate-entering card, and those who ride a motorcycle must wear a helmet). But the rules also make things in manageable, neat, and clean. This is a reason why attractions in Sattahip are always great for tourists to visit. As mention above, Sattahip is the coastal district in Chonburi, so many attractions in Sattahip are beautiful beaches such as Toie Ngam Beach, Sai Kaew Beach, Dong Tan Beach, Nangram Beach, Bang-Sarey, and Samae San. However, there are also other types of attractions in Sattahip – Nong Nooch Garden, Silverlake Winery, Wat Yansangwararam, Sea Turtle Conversation Center, and a few temples. Those who would like to stay for a night or a few nights when visiting Sattahip do not have to worry because there are naval guesthouses for rent to support your need, but you should book a room in advance for a weekend or holiday. You can also find an available room at a city close to Sattahip as Pattaya or Rayong. By the way there are many visitors go to Sattahip for just a one-day trip because it not far from Bangkok. Sattahip Market is shop and store density, including convenient stores. If you take a Songthaew from Pattaya, the end point is also in this market, and you can then take another Songthaew here to some other destinations. It is just like the station of Songthaew for all destinations. There is also the temple of venerable-monk, name "E", closing the market. Lots of visitors go there for respecting him. Sattahip Tesco lotus is also located near the market as well. The most popular beach in Sattahip definitely is Nangram Beach, since its seawater is very clear, and there are also restaurants, restrooms, shops, and parking area near the beach. It is in short ready for supporting a number of visitors to visit the beach at the same time. Additionally, Thai visitors can also get in the Chukrinaruebet Ship locating not far from Nangram Beach. This can attract more visitors to come to this beach. 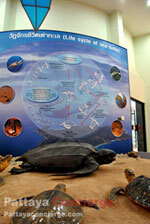 Sea Turtle Conservation Center is one of interesting attractions in Sattahip. Its location is not far from Samae San Village. There are visitors, mostly family tourist group, coming to this conservation every day. You will be able to see sea turtles in different ages here. There is also no fee charge at all, but there is a donating box. 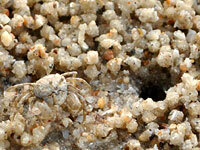 Dongtan Beach is a beach of activities, and its location is not far from Sattahip Market. Seawater activities are similar to other places, but to sail a sailboat is recommended. Activities on the land are interesting, because there are painting and massages at the beachfront. Another beautiful beach in Sattahip is Toei Ngam Beach. To enjoy seawater at this beach is pretty safe because the beach is gradually slope. It will be fine for the kid to go swimming here. Visitors often come to this beach for the picnic purpose as well. Its entrance is very close to Sattahip Market. Samae San Village is a great place for those who would like to enjoy fishing. This is because there is fishing equipment, including boats, to support visitors, and there are also several guesthouses for them to stay a night or more. Apart from this, visitors can also go to the island near the village. It is also a beautiful place. Saikaew Beach is one of beaches under responsibility of Thai Navy. This beach is not so far from Pattaya as well. However, visitors need to pay for its entrance fee for 80 baht (included toilet).There are shops and restaurants at the beach fronts also. To go to this beach is visitors need to turn to Chumpol Sattahip Navy School. Bang Sarey is a fishing village in Sattahip, but it is not far from Pattaya City. There are also beach and seafood restaurants in Bang Sarey. This means that no matter visitors would like to go fishing, have a seafood meal, or enjoying seawater, this village can support them well. Its location is near Nong Nooch Tropical Garden. Khao Chi Chan is a famous place to see a large Buddha image on the cliff. Silverlake Winery is one of beautifully natural attraction to enjoy in Sattahip. Nong Nooch Garden is a interesting tropical garden managed by professional gardeners. Wat Yangsangwararam is a famous and peaceful temple to visit in Sattahip, Chonburi.